Trumac Healthcare is one of the leading Tranexamic Acid Injections Manufacturers Suppliers all over India. WHO:GMP Certified Third Party Contract Manufacturing also available. 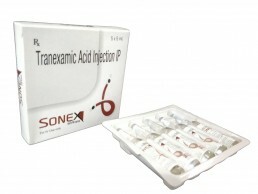 Tranexamic Acid is used in the treatment of bleeding. It is used to prevent or reduce bleeding for short period of time in conditions like heavy periods, dysfunctional uterine bleeding, nosebleed, tooth removal, after prostate surgery or after bladder surgery. Tranexamic Acid is an anti-fibrinolytic. It works by preventing the breakdown of blood clots to control excessive bleeding during periods, or after surgery.